CAMARILLO, Calif. — Nov. 13, 2018 — Semtech Corporation (Nasdaq: SMTC), a leading supplier of high performance analog and mixed signal semiconductors and advanced algorithms, announced that Savant, a leader in premium smart home technology, has built its new IP Video product line on the Semtech BlueRiver™ NT1000 and NT2000 AV-over-IP chipsets. 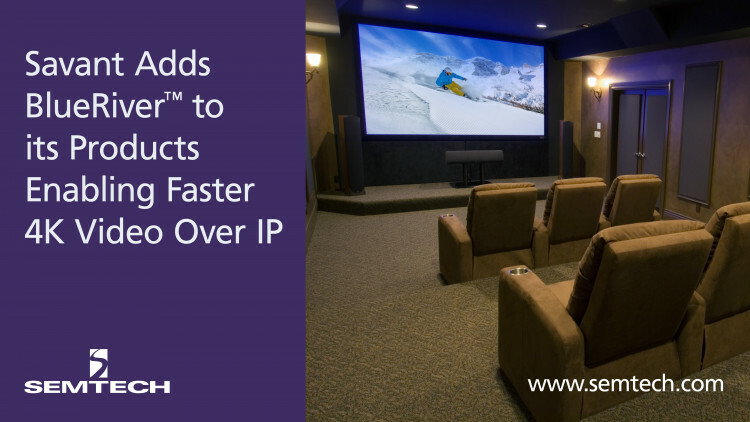 Savant IP Video products deliver an ultra-high-performance pixel-perfect 4K video over IP switching platform that will give Savant’s authorized channel resellers the ability to deliver premium distributed AV content to their residential and commercial clients. Integrated with BlueRiver chipsets, the new Savant product line delivers 4K/60 4:4:4 or HDR video over standard IP networks with sub-millisecond latency. Integration professionals will leverage the convenience of a centralized 10GbE switch, enabling high-bandwidth Ethernet connectivity throughout a project. The video and audio distribution capabilities of this new system cost effectively provide a high quality experience across any job size, with scalability up to 128 zones. Versions of the Savant product built on BlueRiver NT2000 include custom scaling, letting each display receive a signal optimized to its native resolution, and fast switching so that users experience zero blanking or wait time changing sources. Semtech’s BlueRiver™ platform, developed by the AptoVision product engineering team, provides advanced chipsets for AV signal distribution. The award-winning BlueRiver technology has forever changed the dynamics of the Pro AV industry by letting installers and OEMs replace proprietary AV matrix switches with off-the-shelf Ethernet networks that deliver dramatically better price/performance, flexibility and scalability. Enabling end-to-end systems for AV and KVM signal extension, IP-based switching, video wall and multi-view applications, BlueRiver chipsets are the foundation of SDVoE technology, offering zero-latency, uncompressed 4K streaming over standard Ethernet with unique support for HDMI 2.0a and HDR. They also integrate high-fidelity video scaling, windowing and audio downmixing. For more information, visit www.semtech.com/aptovision. Semtech Corporation is a leading supplier of high performance analog and mixed signal semiconductors and advanced algorithms for high-end consumer, enterprise computing, communications, and industrial equipment. Products are designed to benefit the engineering community as well as the global community. The Company is dedicated to reducing the impact it, and its products, have on the environment. Internal green programs seek to reduce waste through material and manufacturing control, use of green technology and designing for resource reduction. Publicly traded since 1967, Semtech is listed on the Nasdaq Global Select Market under the symbol SMTC. For more information, visit www.semtech.com. Semtech and the Semtech logo are registered trademarks or service marks, and BlueRiver is a trademark, of Semtech Corporation or its affiliates.